Finally, the spring/summer issue of Leenia (#7 2009) made for the Lee jeans brand. The theme this time is virtual reality and cyberspace. And as usual I had to reinvent the layout completely. (Did I mention that I love to design this mag?) On the cover are three fifths of performance collective Babaryba. The shoot was made by photographer Justyna Cieślikowska and special fx designer Łukasz Huptyś in an abandoned factory on the outskirts of Warsaw. I used a free font called Athens Classic for all the headlines (made by Soixantedeux). 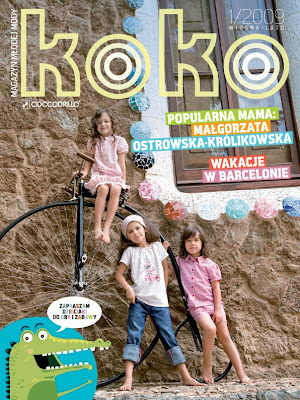 The magazine is distributed in Lee stores and cafés in Poland. The table of contents. 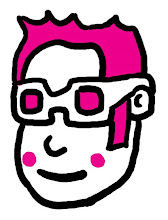 100% magenta – my favourite colour – is a dominant in this issue. The large numbers were used in an earlier issue of Leenia and are made from stencil graffiti I have found in a carpark. In this section we present famous people who are all called Lee-something. Alan Lee is a well known illustrator who has made book covers for Tolkien and loads of other fantasy authors. I made the small portrait. Lee Bul is a female artist from Seoul, Korea. She fits into the cyber theme of this issue as she makes incredible cyborg sculptures using high-tech materials. An exhausting interview with talented Polish animation artist and film director Tomasz Bagiński. One of his short movies – The Cathedral – won a British Academy Film Award and was nominated for an Oscar. To illustrate the text I used frames from some of his productions. In each issue a designer is invited to reinvent Lee's clothes. This time up it's designer/artist Paweł Kozłowski, aka Swanski. A text about contemporary artists who make illusionistic art: Bill Viola, Yayoi Kusama and Tony Oursler. This text entitled "The End Of The Future" is an attempt to define the influence of cyberpunk on music and fashion. The conclusion is that cyberpunk – as a fashion statement – is dead. Still it's good to read about bands that I used to admire as a kid like Skinny Puppy, Kraftwerk, Einstürzende Neubauten, Laibach and Front 242. I love the dirty greenish background here. Starting in this issue is an event spread with upcoming concerts and festivals in Poland. I kept it as simple as possible: black and white pics + pink text. A cool text about collectors of ephemera and vintage junk, a hobby I enjoy myself. I'm particularly proud of the opening illo. I used thumbnails found on internet auctions. A low budget shoot of Lee clothes. I used a friend as model and had to draw the background myself. The design is obviously inspired by the movie TRON. Sylwia Restecka made the opening illustration for this text about VR in films and pop culture. The second spread is illustrated with frames from TRON. I actually watched the film for the first time since 1982 (which makes me very old) and I have to say it's still damn good. The special effects are amazing. Most of them were made without the use of computers! The closing spread and the credits. End of line. Editorial & credits. The little green fellow on the left is called Koko and was designed by Tomek Tulikowski. Koko will appear all over the mag as you will soon find out. Interview with Polish soap star Małgorzata Ostrowska-Królikowska who has... five kids! Gosh. The psychology section with texts about motivating children. And that's my illo up on the first spread. This text is about having pets. A bunny in this case. Interview with child actress Wiktoria Gąsiewska who is mostly known for her role in Jasminum by Jan Jakub Kolski. A text about traveling to Barcelona with kids. This fashion shoot was produced by Nafta Squad exclusively for Coccodrillo on location in Barcelona, Spain. This is the opening spread of the kid's section. This is the fun&games section for the youngest kids. Adam Świderski made the illos on the left page and I made the puppy on the right. Some fun for the older kids. These cool illos were made by Wiesław Skupniewicz. This space-game is for kids who can read and write. Created by Ola Trościankowska and extremely talented artist Jacek Frąś. A crossword for kids and parents. Illustration by Wiesław Skupniewicz. Easy to make cooking recipes for the kids. And it sure was good fun to prepare the cucumber crocodile for the shoot. The culture section with new books and event schedule. Nice things to buy and have.